Nothing matters more to us than the safety and wellbeing of your students. That’s why we provide 24/7 in-country support, satellite communications, international medical assistance and comprehensive insurance. From meeting you at the airport to giving you an orientation briefing, our experienced support team are on hand for you and your students from the moment you arrive in Africa. And if an issue should arise during your field trip, we’re there on the ground with you to resolve it, swiftly and professionally. You can get in touch with us at any time by phone or email. We keep detailed information on each traveller and your group’s itinerary, so we’re always up to speed the moment you need us. We also maintain a bank account in Southern Africa so access to money is never a barrier to us resolving an issue quickly and professionally. We use certified Hazard Identification and Risk Assessment (HIRA) practitioners to regularly assess every location and activity. Throughout your expedition, you’ll be guided and mentored by experienced coordinators. All our expedition leaders and project coordinators are qualified and many have worked in their respective fields for a number of years. 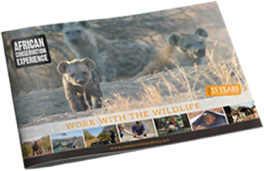 They are experts at inspiring students about the world of wildlife conservation, while making sure every traveller is engaged and involved. As part of our strict health and safety guidelines, we require all the projects we partner with to have comprehensive medical kits on site and staff members who are fully trained to at least a level 1 qualification in first aid. On the rare occasions where a medical issue can’t be resolved on site, projects have access to 24-hour emergency medical support and assistance from doctors and hospitals within reach of the project site. In some of our more remote destinations, travellers also have access to a helicopter medical rescue service. Standard mobile phone reception is often poor in remote areas of Africa. In some of our more remote destinations, our teams on the ground are equipped with a satellite telephone. This enables them to contact doctors, transportation companies and other support networks, no matter their location. In preparation for highly unlikely but potentially serious events such as political unrest or a serious medical problem, we have developed a comprehensive evacuation plan for every location your students may visit. We have comprehensive public liability insurance and, As a UK-based travel provider we are protected by ATOL (Air Travel Organiser’s Licence) and have full public liability insurance. This means the flight-inclusive experiences we provide are protected by the ATOL scheme. Please see our booking conditions for further information or for more information about financial protection and the ATOL Certificate go to: www.atol.org.uk/ATOLCertificate. We also maintain a bank account in Southern Africa so access to money is never a barrier to us resolving a local issue quickly and professionally. When it comes to ensuring your students have a safe and rewarding expedition, a little preparation goes a long way. Carrying the right insurance is vital for any trip – especially when you’re spending time around wild animals and living in a bush environment. For this reason, we require all our travellers to carry suitable insurance before they travel. If you want, we can help you arrange insurance for your students, using a leading comprehensive policy provider we’ve known and trusted for years. We specialise in helping your students arrange all the necessary paperwork and will advise you in plenty of time what you need to do to obtain the necessary documents before you travel. Individual’s visa requirements will depend on your country of residence, destination, and the age of your students. Travellers under the age of 18 need to carry special documentation when visiting Southern Africa. We want every one of your students to have a life-changing experience in Africa. So we provide regular guidance and advice about your plans, learning goals, educational values and logistics before you travel. Our staff are experienced conservation travel experts and are available to talk, either by email or over the phone.